Through a monthly infographic, using stars to rate the image of Mexico just like a book or movie review, Ecos de México takes look at the international media’s perception of the country. News and articles from newspapers, magazines and online news sites from around the world are monitored to analyze the perspective of Mexico. The main objective is to raise awareness among the general public about the external image of the country. We tend to read our national press, however, most of the media in Mexico has limited information due to conflicts of interest; most of the news related to insecurity and corruption scandals is released by international press and are not portrayed in the national media. Therefore, it’s important to examine different perspectives, and our goal with Ecos de México is to highlight what the world is saying about Mexico, both positive and negative. The overarching communication objective is to inform and to generate a different perspective in the Mexican population by providing a plural and objective vision of the country’s current issues from an external point of view. A star-based classification, similar to that which is used for books, films, hotels or restaurants, is adapted to show how positive or negative the perspective of the news piece or article is. 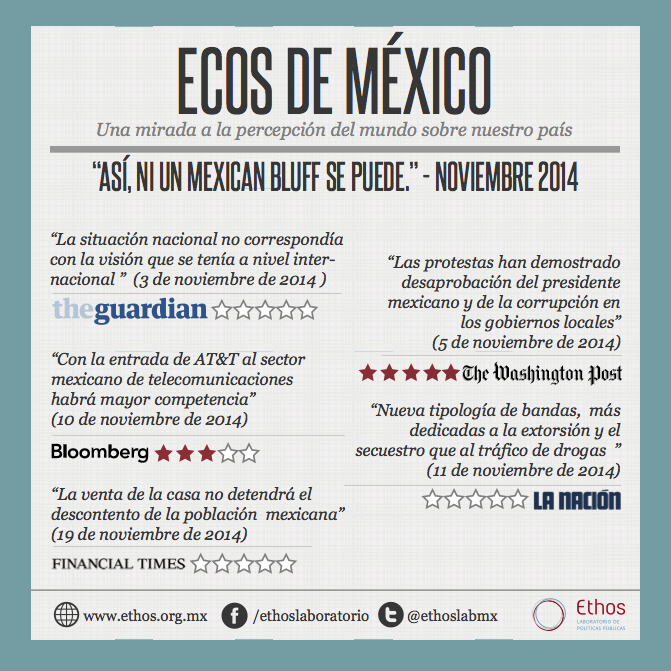 Ecos de Mexico is published on our website, as well as on an online newspaper called Arena Publica. Along with the infographic, a summary of the articles and news that were analysed is published online, as well as an opinion article written by the Ethos team. By portraying the most relevant news or articles in a few sentences, with an innovative and fresh image, each month we attract more readers and expand a distinct outlook of Mexico. Ecos de México generates interest in the international perspective of the country, the innovative infographic attracts numerous people and it is vastly commented on and constantly retweeted and shared on social media. Since it’s published on our website it generates more traffic and more viewers not only to the infographic but also to other of our publications and analysis. Moreover, newspapers and online news sites often use the articles from Ecos de México.